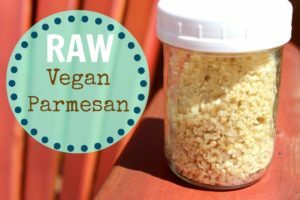 We are going to show you how to make a healthy raw vegan parmesan cheese recipe that is incredibly easy and quick. Do we have any parmesan cheese fans out there!? Well we have a treat for you: a healthy raw vegan parmesan cheese recipe that is delicious! This goes great sprinkled over some zucchini noodles and fresh marinara or even on some crackers and dip. No longer will your plant based pasta go un-topped! You can also use this to top off your favorite salads as it’s very versatile and will become a lot of peoples “go to topping” very quickly. Grate or process nuts in a food processor. Add remaining ingredients and process until the texture becomes a parmesan cheese topping. Store in air tight containers in the refrigerator for up to 5 days. Nutrition is the first of our three fundamentals of our comprehensive cancer care program where we teach people how to stop making cancer. It is so important to eat a raw vegan diet and green juice daily to help support a fully functioning and optimal immune system. Embracing the lifestyle we teach here at Oasis helps people stay focused on restoring true health. Reach out to us with any questions that you may have, we’d be happy to help. We hope you enjoy this healthy raw veagn recipe and all the recipes we share with you to help you add variety to your diet and be creative yourself. We will continue to provide whole food vegan recipes to share with everyone so you can add them to your routine at home and involve your family in the process. This is part of our ongoing committment to deliver consistent value to the people who visit our healing center and their families.